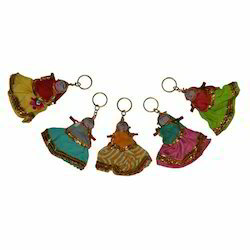 Fine Decorative Rajasthani Dolls Keychain Available In Different Designs & Sizes. This is 100% ecofriendly, handmade and handicraft product. We are the manufacturer of the fashion doll key chain that is completely made up of finest brass. The perfect finish of the product with its unique design makes this key chain more gorgeous and appealing. The fine quality of brass ensures its durability and strength for a long time. The product is available with us genuine prices. In order to keep pace with never ending demands of clients, our company offers Doll Key Chain. Key Chain Doll hand block print fabric from our chindi collection making good use of our scrap.